This series of pins are designed to be worn on a jacket lapel or a sweater on the left side so that the beads frame the outside rim away from the face, bringing the eye back to the face. Or wear it as a necklace with a sterling silver brooch converter and a 4mm rubber cord. 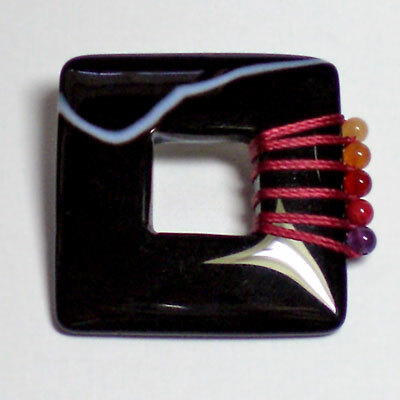 It is shown here as a brooch, the picture with the cord as a neckpiece is coming up. Square has 50 mm sides. Assorted Beads are Peach Aventurine, Carnelian, & Amethyst. Comes with sterling silver converter and black rubber cord.